Reaching speeds of up to 200 mph, wind turbine blades are susceptible to damage from tiny particles including sand, rain, hail and salt spray. What type of erosion occurs in the field and what effects does it have on wind turbine blades? The most common form of erosion in the field is through pitting, gouging and delamination of the edge of the blade, referred to as leading edge erosion. This type of erosion not only compromises the integrity of the blade, but also impacts its aerodynamic efficiency, leading to a significant loss in annual energy production (AEP). Studies from several sources have demonstrated that even minor erosion damage can lead to an AEP loss of at least four percent and up to 20 percent in severe cases. What are the challenges O&Ms faces when proactively protecting wind turbine blades from leading-edge erosion? Reaching speeds of up to 200 mph, wind turbine blades are susceptible to damage from tiny particles including sand, rain, hail and salt spray. These forces can be enough to cause enough damage to reduce wind blade aerodynamics. Additionally, if the blade deteriorates to the point where water can enter, it can ultimately fail, severely impacting the entire turbine. What are the different products 3M manufacturers to protect the leading edge of wind turbine blades? Wind Protection Tapes: Originally developed for helicopter blades and aircraft surface protection, tapes are constructed with durable, abrasion- resistant polyurethane elastomers that are capable of resisting erosion, puncture, tearing and weathering. Wind Protecting Coatings: This product provides a polyurethane coating applied via brush or casting, giving a layer of defense against damage caused by sand and rain erosion, as well as minor impacts. Epoxy & Polyurethane Fillers: Manufacturers often utilize epoxy or polyurethane fillers, as they are able to fix surface defects after de-molding or create a smooth transition between blade halves. Many fillers are not designed for erosion. As the leading edge shape is built with fillers using the right filler is also key to preventing erosion. Given the environment of a turbine location, can 3M recommend a combination of products to best suit the installation? Overall, wind protection tape is often one of the most popular choices to repair damage as it provides a consistent solution, with uniform thickness and finish. Wind protection coatings and fillers are also options as they can be utilized during the manufacturing process or in the field. In addition to implementing preventative measures to extend the life of wind turbine blades, it is important to consider design upgrades that optimize aerodynamic efficiency. When bonding aerodynamic attachments, a high quality bonding solution that provides strength, durability, toughness, environmental resistance and efficiency is vital. Acrylic foam tapes has been the industry leader in this application, its ability to be flexible yet strong creates provides the right surface bonding mechanism for aerodynamic attachments. What should O&Ms be aware of when evaluating protection options? When evaluating which product is best for a project, it’s important examine many factors such as installation conditions such as application temperatures, humidity etc. The format of the product becomes key as well. With recent product innovations, options such as wind protection tapes or newly designed coating are designed for simple application in the factory or in the field via rope or platform access even in the most extreme weather conditions. Understanding the product application and performance for a particular site or location is key. Can you speak to the efficiency of a properly maintained wind turbine blade compared to one that suffers from leading-edge erosion? The benefits of a properly maintained wind turbine blade include a significant reduction of leading edge erosion, extended maintenance and service intervals, decreased amount of downtime and increased service years, annual energy production and return on investment. A wind turbine blade that suffers from leading-edge erosion can lose four percent of its annual energy production, while severe erosion can lead to a loss of up to 20 percent. Are there additional steps to preserve wind turbine blades, ensuring greater efficiency and a higher ROI? As part of a proactive maintenance plan, leading edge erosion needs to be addressed to maintain aerodynamic efficiency. By implementing a duel strategy that addresses both prevention and repair through the use of the right fillers, protective coatings, tapes and aerodynamic upgrades, the service life of turbines can be extended, as well as achieve an increase in overall performance and efficiency and greater ROI. Is 3M involved in solutions for other alternative energy systems? Santhosh Chandrabalan is the global head of 3M’s Wind Energy Group. He has a degree in Composite Material Engineering and Engineering management. 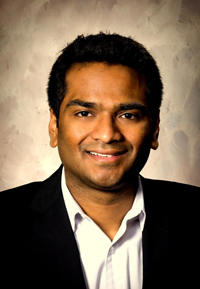 Santhosh has been in the Composites and Wind Industry all through his career. His experiences include research in composites, process engineering, engineering management etc in the Wind industry.